It can be hard to eat well and stick to a diet - especially if we lead busy lives or work long hours in the office or other place of work and get home after the stores have closed. Even if we have plenty of time - if we live alone, it can be hard to find the motivation when cooking for one. There are many different problems which can make it difficult to eat well, but the increased energy and wellbeing doing so will bring, make it worthwhile to make the effort. Here are a few tips to help you stick to your resolve. Remember that if you are following the total agewell plan and enjoying fresh air and regular exercise, you will start needing to eat less and wanting to eat more healthy food. When you cut down on things that are bad for you, like too much sugar and salt, you will eventually lose the craving for them and it will be easier to avoid them. But don't be too hard on yourself or you'll be setting yourself up for failure. Don't cut all your favourite foods out of your diet or you won't be able to stick to it in the long term. If you have a sweet tooth, plan for desserts - just make sure that you gradually cut down the sugar content - and have the occasional glass of wine if you enjoy a drink. If you find that you have little time to to plan shop for and cook healthy meals, the answer is to simplify. Don't try to cook gourmet meals. Plan a healthy fast-food diet that does not contains too many ingredients and doesn't take too long to prepare. 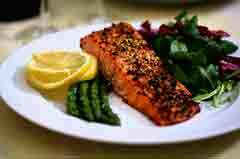 For example, a piece of salmon, vegetables and salad can be prepared in less than 20 minutes and is delicious and full of vitamins and the right kind of fat. If you are not sure if you'll be eating at home, make sure to plan for meals using ingredients which will keep and always have some stand-by menus on hand. When you do have time invest some of it in finding promising recipes on the internet or in your favourite magazines. 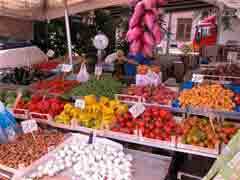 Try and visit markets or go directly to the farm and buy the freshest best quality foods you can. You will be surprised how delicious low-calorie nutritious meals can be. And remember the words of that famous song and If you fall by the wayside, pick yourself up, dust yourself off and start all over again. The Raw Food Diet is a diet based on unprocessed and uncooked plant foods, such as fresh fruit and vegetables, sprouts, seeds, nuts, grains, beans, nuts and dried fruit. It is credited with numerous health benefits, including Increased energy, a healthier skin and brighter complexion, improved digestion, weight loss and a reduced risk of heart disease. The main thing about the raw food diet is that all the foods you eat are unprocessed foods. Superfoods might be a recently coined term, but these are all foods that have been helping our ancestors stay healthy for years and the common denominator - the one thing that these foods have in common is that they too are unprocessed foods. Follow the link above and visit our new page all about these foods. This page will eventually grow into a section as more in-depth pages are added about every one of these superfoods and what they can do for your health. 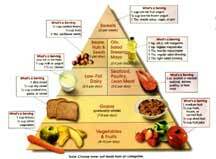 The DASH diet has been proved to reduce blood pressure, which can help you live a longer and healthier life. This site contains a selection of delicious recipes to help you do this. Chinese Holistic Diet Learn precious 5000-year-old ancient Chinese holistic diettherapy; Find the right delicious healthy chinese recipes and diet plans foryour health. The Power of Fruit ... expecially exotic fruits prevent and fight diseases, slow down the anti-aging process and give athletes more strength and energy - without any side effects! 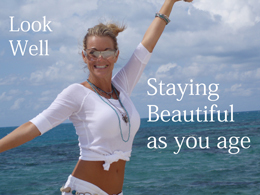 Eat More Raw Food Get the look and health you always wanted by trying the raw food diet.